for any national defense features incorporated in the design of the new ships with Socony-Vacuum meeting the higher operating costs. The biggest change involved the propulsion system, which had to be redesigned in order to raise the sea speed from 131/2 knots to the 161/2 knots required by the navy. Under Pluymert's direction, Socony successfully squeezed a 12,000 s.h.p. unit into the same space used by the 4,000 s.h.p. turbine in the original design.7 The problem of increasing the steam-generating capacity was cleverly solved by flaring the boilers so that the upper portion was wider than the base, thus taking advantage of the total space available without increasing the deck space required for the new boilers. Other changes made to the original design included the addition of gun foundations, magazine spaces, and added crew spaces. In an effort to enhance the speed characteristics of the proposed vessel, the maritime commission conducted model tests to improve the design of the underwater hull.8 Based on this work, the commission's staff of naval architects developed a new lines plan that would have included a semibulbous bow had it been adopted.9 Although the revised design was less than 500 feet along the waterline, it was still designated as a T3-type tanker in the title block.10 Since this design had the same dimensions as the Mobilfuel and the Mobilube--500 feet overall (o.a. ), 487 feet between perpendiculars (b.p. ), and a 68-foot beam--it is clear that at this juncture the commission considered the Socony/Bethlehem design a single-screw variant of the original T3-S2-A1 design concept for high-speed tankers, hence the use of the T3 designation. This rather incongruous assignment of type number would form the foundation for a great deal of the future confusion concerning the various design types built by the maritime commission and the actual differences in their physical characteristics. In future contracts, the T3 designation would be used to signify the Bethlehem design (T3-S1-A1) and would be unrelated to size. Socony-Vacuum awarded construction contracts to Bethlehem Steel for the first four ships on 1 November 1939.11 Orders for an additional two ships were placed on 10 January 1940 for a combined total of six vessels, all to be duplicates of the Mobilfuel and the Mobilube. After completing successful negotiations with the maritime commission, the contracts for all six vessels were amended to include the increased speed and additional defense features that were to be subsidized by the government. for the Socony-Vacuum vessels, the maritime commission announced that it was requesting bids for the construction of six more tankers similar in design to the six just ordered for Socony-Vacuum. Potential builders were requested to submit bids on two different types: the T2 of 161/2 knots and the T2A of 131/2 knots.12 The difference in costs would be used to justify cost subsidy to be paid by the government for the added speed. Bids were to be submitted no later than 19 March 1940. The lowest bid for the 161/2 knot type was received from the Sun Shipbuilding and Dry Dock Company.13 Lower still was the alternate bid submitted by Sun for building the requested ships to their own design. These were offered at a price $40,000 per vessel less than the base bid, even though the proposed ships would be 121/2 feet longer (b.p.) than the design based on the Socony-Vacuum type requested by the maritime commission.14 On the basis of this bid, Sun was subsequently awarded contracts to build five national defense tankers for the Keystone Tankship Corporation. The first two ships were ordered on 20 April 1940.15 This was followed in June with orders for three additional vessels of the same type. As was the case with the Socony-Vacuum deal, the maritime commission would pay the cost differential for the increased speed. 16 September 1942 as the second Neosho (AO-48), replacing her namesake sunk at the battle of the Coral Sea in May (see chapter 17). The Kennebec was driven by a single screw powered by a cross-compound, double reduction geared steam turbine manufactured by Westinghouse. The turbine was designed to deliver a maximum of 12,000 s.h.p. when supplied with steam at 375 psi and 700 degrees Fahrenheit. For backing power, an astern turbine was incorporated in the low-pressure casing. Steam was supplied by two Foster Wheeler "P" type marine boilers at 450 psi and 725 degrees Fahrenheit. These had been specially designed to fit into the limited space available. Each boiler had a normal capacity of 52,500 lbs/hr and a maximum capacity of 58,000 lbs/hr. Table 11 summarizes the Kennebec's characteristics. Length, between perpendiculars 487' 6"
Depth, molded to upper deck at side 37' 0"
Draft, molded design 29' 81/2"
driven by a 200 hp electric motor connected to the pump by a jack shaft running through the bulkhead separating the motor room from the pump room. The pumps, which were manufactured by the De Laval Steam Turbine Company, had a capacity of 1,900 gpm, sufficient to load or unload the vessel in about sixteen hours. Three rotary-type stripping pumps were also supplied: two motor driven and one steam turbine driven, each having a 400 gpm capacity. Length, between perpendiculars 500' 0"
Draft, molded design 29' 111/2"
 Total cargo including diesel oil, lubricating oil, and gasoline. None of the national defense tankers built by Sun were completed prior to the outbreak of war. The Aekay was the first to be finished. She was delivered to the Keystone Tankship Corporation in February 1941 and immediately pressed into service. 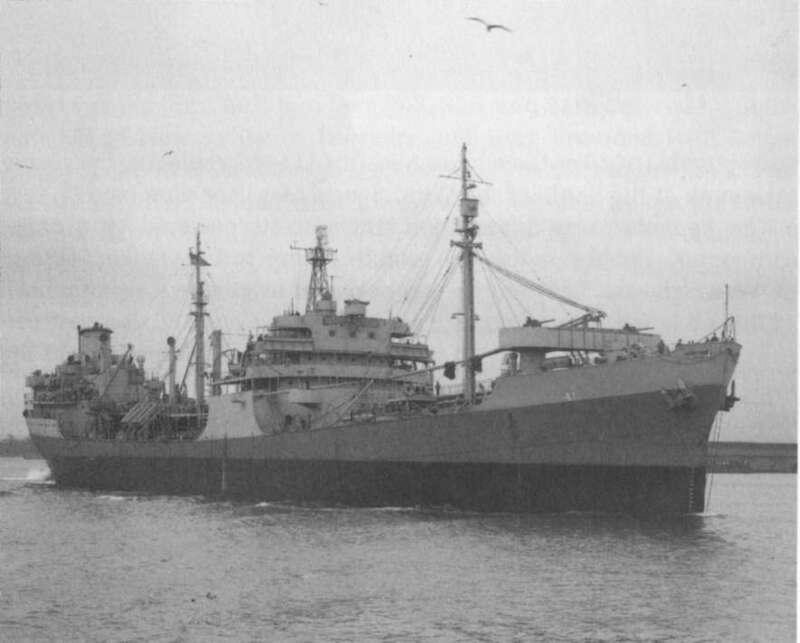 Had she not been on a voyage to the Far East, the Aekay would have been the first of her class to be acquired by the U.S. Navy.18 Instead this honor went to the Kalkay, the second Keystone tanker to be completed by Sun. Tankers were urgently needed by the navy and she was acquired immediately upon completion in March. 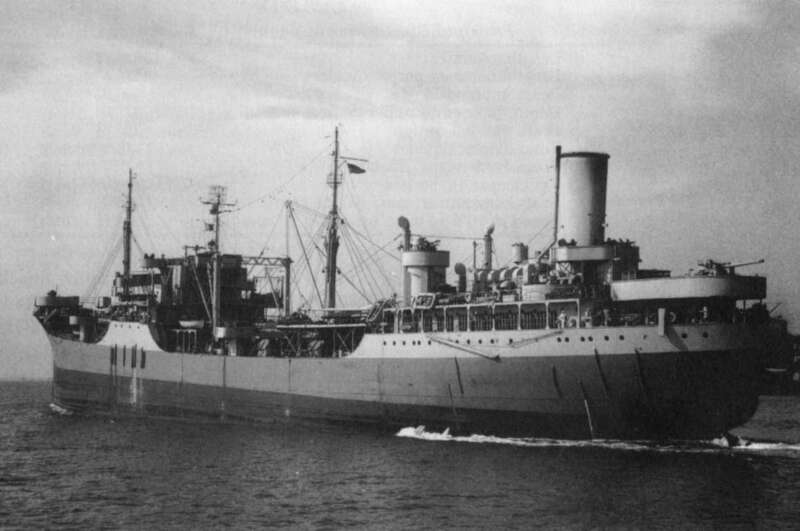 Renamed the Mattaponi she was commissioned on 11 May 1942, becoming AO-41. Mattaponi was followed by the Tappahannock (AO-43; ex-Jorkay), Monongahela (AO-42; ex-Ellkay), Neches (AO-47; ex-Aekay), and finally Patuxent (AO-44; ex-Emmkay), the last of the Keystone tankers to be transferred to the navy. The Mattaponi was very similar in design to the Kennebec. The arrangement of both vessels was based on previously accepted commercial designs for single-screw bulk oil carriers, modified to provide the 161/2-knot sea speed desired by the navy (see table 12). The Mattaponi was slightly larger, however, having been built to a somewhat newer design standard. Mattaponi's larger hull provided the extra space needed to mount the larger boilers that were required to provide sufficient steam for the more powerful (12,000 s.h.p.) turbine. This was a decided advantage over the Kennebec design since it eliminated the need to fabricate specialized boilers.